McGregor posts a photo alongside Donatella Versace, Lewis Hamilton, and Rita Ora, at the British Fashion Awards. McGregor parties at wedding of childhood friend Tom Devitt, in Ibiza, still sporting a black eye from the fight. He is accompanied by his mother, Margaret, and partner, Dee. McGregor congratulates his friends and looks forward to the party. On a visit to the coastal town of Skerries in Co Dublin McGregor is mobbed by fans in a local pub. Landlord Ollie Grimes says Gregor found out about Ollie’s Place through an MMA connection: head chef Stephen Kavanagh is the brother of MMA womens’ champion Sinead Kavanagh. I just got a call from Conor asking if he could pop out to Skerries for a bit of craic. I told him ‘come on out’. The next thing I knew he was stood next to the regulars in my bar. I’ve had Nicky Byrne of Westlife, and Roger Daltrey of The Who drinking in my bar but I’ve never seen anything like the crowd that turned up to see Conor. He really is the people’s champion, signing autographs for everyone and doing pictures. After closing Ollie put Conor up at his own home rather than sending him back in a taxi to Kildare. There’s no hotel in Skerries so I thought he can stay with me but I wasn’t really sure my wife would believe me when I rang her to say Conor McGregor was staying over. That is until I arrived home at the door with Conor beside me. 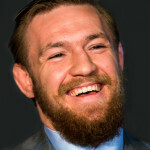 I woke up the next morning thinking I’d dreamt the whole thing up, but there was Conor ­having breakfast with my family. I waved him off a while later. He was a huge hit in ­Skerries. McGregor attends a party in Liverpool, after the Grand National. In the video he appears to be firing dollar bills that have his face on them into the crowd. McGregor attends the Grand National in Aintree, Liverpool. He wears a Louis Vuitton shirt open to the waist, and white trousers. McGregor arrives in Liverpool ahead of a visit to the Aintree Grand National. He touched down on his private jet at John Lennon Airport before leaving in an entourage of five high performance cars including three £200,000 white Rolls Royces. McGregor goes out partying in New York City. [I’m gonna] take the world by storm. Stay calm in the chaos. Controlled in the chaos. Relax. Let it come to you. This is your night. Ahead of his live event in front of 5000 fans in Manchester, McGregor makes himself a chocolate milkshake at Archies Burger and Shake bar in the city. McGregor visits Dicey’s, a club in Harcourt Street, Dublin, where he joins in a student night. Video is released of McGregor entering El Divino club in Belfast. McGregor stayed for a few hours according to the club, arriving at 12.15am and leaving at 3am. McGregor parties in New York after his win over Alvarez in UFC 205. McGregor arrives at Madison Square Garden. McGregor attends an open workout at Madison Square Garden. McGregor lends his support to the Dublin Team, lifting the Sam Maguire Cup ahead of the All-Ireland Final replay. McGregor and Alvarez face off at the UFC 205 press conference. McGregor attends his pool party at the Encore Beach Club in Las Vegas. Wearing sandals, it’s clear his foot is not injured. Horan and McIlroy are among the guests attending McGregor’s UFC 202 after party at Intrigue nightclub, in Las Vegas. McGregor arrives at his UFC 202 after party at Intrigue, at the Wynn Resort, Las Vegas.